This is hard for me since I haven't been really open about this matter until now. At first I thought there wasn’t a problem with me, maybe result of my obviously wrong perception and also cause of my ignorance regarding the topic. I have an eating disorder since 2005 and since then, my life has been, literally, a living hell. A lot of people think that having an eating disorder is “stupid” or “childish” or “selfish” because they think it’s only about the desire to be “pretty” or “skinny”. But it's not. It's something much more complicated that comes from the desire to have the control of my life again. Since early 2000 I started to struggle with many changes in my life, since having to leave my hometown to study in other city with a complete different culture and education, to my father’s sudden death. I’m such an apprehensive individual. I live with anxiety as my shadow. Any tiny thing that could shake my world, causes me a BIG trouble. I’m scared of changes. I cannot deal with them. I rather prefer to stay stoic that having to face a situation that could represent a spin –big or tiny, it doesn’t matter- for my current way of living. I cannot deal with stress either and sadly, I chose a job that keeps me stressed out 24/7. This situation plus the circumstances that have been happening in my family, made me react in the wrong way, affecting my perception in a way I never imagined, passing from "just" having a eating disorder to start hurting myself. 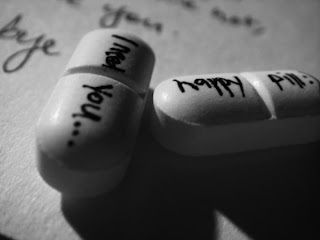 I’m addicted to diet pills. At least that’s how my eating disorder begun. I was diagnosed by a certified doctor at the beginning but after a few months in treatment, I started to see myself as a complete other person. I started to freak out if I gained weight, even if the increase was minimum. I became hysterical about that matter and ran to the drugstore to find the “solution” for my “weight problem”. And at the beginning it did work, but it didn’t come alone, you know? The secondary effects got worst with time. I started to get depressed and cranky the entire time, I didn’t want to leave my house, I didn’t want to have human contact of any kind. I stopped to enjoy my friends’ company and at the end I got 100% isolated. As I have been living by my own since early 2003, I've never been checked by my mother, and I’m thankful for that, since I know that if she finds out what has been happening to me for so long, and somehow, provoked by myself, she will be 100% disappointed and that will kill her, literally... I cannot deal with that. When I left home I thought I was fine since, under my opinion, I didn’t have an eating disorder “per se”, that is, anorexia or bulimia. I know now that I do have "bulimia nervosa”, which started with the constant ingesting of diet pills as well as with the fact I over-exercised myself. But today, it's much more complicated. A few weeks ago I stated purging certain meals, even when I didn't binge prior. I know, I’m aware I sound damn stupid... Even more stupid because, having what I do have in my life, being a grown woman, you know? 31 years old, I’m destroying myself, mentally and physically, and I cannot find the way to stop this behavior. I wish it was as easy as just “stop doing that, stop taking pills, stop purging”. It is not, not at all. The last few months thing got worst because the delicate situation in my work. I have to stay at the office more than 12 hours which leaves me no time, no time at all, to go to the gym or to go to the pool or what I used to do to maintain myself a bit more healthy. I’m not saying that my problem is not the fact that I want to be skinny, I do want. I see the image in the mirror and I see another human being there. But having lost all the control regarding my family’s economical and emotional situation, having lost the control I used to have at work, having lost my friends because my desire of being lonely, the only thing that I stupidly thought I could control, was my body. The fact of being “skinny” makes me feel that I’m capable to control something at least, even when I’m obviously hurting myself. It’s strange and weird, and might sound pathetic for you, cause I am aware I do have a problem but I’m not ready to find the help I need. I don’t feel a doctor or a psychologist or whoever can help me. I did attend therapy for a while, but then -and I think it’s supposed to be that way- I started to develop more fears and started to discover that I have more issues that the ones I thought. That scared me too much, cause I don’t know how am I gonna be able to face them when I’m currently unable to face with the one I know for sure. But I’m desperate, because I started to do certain things that I thought I was not capable of. For example, the purging. I never, ever, in my entire life, thought that I was a person who could fall into that. I mean, the diet pill thingy was so “easy” (despite the huge amount of money I’ve waited on them), but the fact of starving myself to death or the purging myself daily, is a situation that any of you want in your life, trust me. I’ve gained anything but the lost of my self-confidence, the lost of the love and respect for myself. I’m 24/7 depressed, I’m not focused anymore. I lost any will to properly live, to enjoy, to have fun; I’m constantly cranky and moody. I deal with insomnia since early 2006, I’m constantly tired. But the worst of everything is the lack of that spark that takes us to fight for ourselves, to achieve goals. It’s like living while you’re already death. Plus to that, I tend to have this “episodes” of rage; I lost control over myself and I started to hurt myself because the frustration I feel. I cannot explain how I feel and how the fact of hurting myself calms me down sometimes. I reached the pity point of thinking that the only thing worthy about me, is the “beauty” I can show to the outside. What a fool I am, hah? Even when I am skinny, I don’t feel any relieve, for the contrary, I find myself disgusting the most part of the time, but I pretend, I pretend I’m happy, I pretend I’m healthy, I pretend I feel a successful woman, I pretend I have a life. Behind the curtains, I'm nothing but a bunch of bones craving for being loved, no matter if they are covered with skin or not. If I decided to talk about this is because I reached the point where I’m truly scared about my mental and physical health. I’m scared of myself and the harm I know now I’m able to do to my person. I’m scared about all those times I feel incredibly depressed that I couldn’t even leave my bed. I’m scared of the fact that if I keep this growing and growing I’ll end disappointing a lot of people, people who cares about me, deeply. I’m scared of all those tiny moments when I think everything could be better if I wasn’t here anymore. I’m scared I could find the courage to cross lines someday. I know there’s a long road to walk regarding this matter. I know that, as I don’t believe I need professional help, I’m gonna be unable to get better. I know. But for now, I think that if I share what has been happening to me for so long, I’m gonna gain some tiny minus battles against what my brain constantly repeats to me: "you’re no body if you aren’t skinny". I know I'll lose credibility, I know I'm going to disappoint a lot of people on my way -that's the main reason I didn't come clean before-, but to be honest, I cannot keep pretending and drown me entirely into this, I'm more scared about my own life than anything else. Notwithstanding my current situation, I want to be clear, I'm not pro anorexia or pro bulimia or pro self-injury. I’m not supporting this kind of behavior at all. Trust me. This isn’t life. It’s tremendously painful because there’s nothing as painful as waking up in the morning and wear this daily “I’m an happy human being” mask trying to avoid other people to see the dark side of you. As I said, and I’m being 100% honest, living with an eating disorder is a real living hell. I just read your words.. and it pains me a lot. I really know what are you talking about.. I was in that kind of hell.. It is hard to explain by words..But if you will, you can contact me..and at least we can talk. The key from the door out of that hell is in you-and it is love. To love yourself. You have to learn love yourself. When you don´t love yourself, you can´t truly love anyone else..
Barbie, I am kilometers away from you, but I am sending you lots of love and understanding. Because you are beautifull human being. Barbi, para vos esta dedicada mi entrada de LJ de hoy. Es importante. @Anonymous: Sorry for the late response. I've been pretty busy this season at work and also tryin' to find a trigger that makes me take action regarding this issue. I really appreciate you took the time to read me and to encourage me to get better. There's a lot of work to do tho, but I have the disposition to finally change my mind. I cannot say something else but THANK YOU.